On the day that President John F. Kennedy was shot, November 22, 1963, a classmate told me that she could see why I was upset, as I was a Democrat, like the president. But why should she, a Republican, feel bad? Something like that is going on now, with the Ferguson/Michael Brown grief and protests. Now, as in 1963, the voices that say “their sorrow, their problem, not mine” are wrong. We are all in this together. Why Michael Brown and Ferguson? Michael Brown and Ferguson bring the political and abstract problem of racism up close and personal. The story began August 9, when police officer Darren Wilson shot and killed Michael Brown, an unarmed, Black teenager in Ferguson, Missouri, a suburb of St. Louis. You can find the details of this story here. The killing stirred up national outrage and protest in August, and again at the end of November, when a grand jury failed to indict the police officer. Michael Brown’s death is part of a widespread pattern of police violence in the United States. Police shoot and kill young Black males at a rate 21 times higher than young white males, according to a Pro Publica analysis. Al Jazeera listed twelve people killed by police across the United States in the week before the Ferguson grand jury decision, and that is likely to be lower than the actual number. Ferguson is a Black majority city suffering from poverty and powerlessness. People of color, mostly Black, make up 67 percent of Ferguson’s population. Ferguson’s police force is about 95 percent white, as are its mayor, police chief, all school board members and five out of six city council members. In 2013, more than 93 percent of people arrested in Ferguson were Black, according to a Missouri state government report. Poverty and race are tightly connected in Ferguson, as they are across the United States. Ferguson, a suburb of St. Louis, Missouri, has a population of about 16,000. The racial makeup of the town changed from 75 percent white in 1990 to 67 percent people of color in 2013. According to Time magazine, the unemployment rate went from five percent in 2000 to 13 percent in 2010 and the number of residents living in poverty doubled. What happened, and what continues, in Ferguson represents and reflects the cancers eating at the entire U.S. society. More than 40 percent of people incarcerated in the United States are Black. Most of them are poor, as are most of all of prisoners of all races. The well-documented cradle-to-prison pipeline means that one in three Black male babies born in 2001 is likely to be incarcerated during his lifetime. After the immediate protests on November 24 and 25, organizing shifted to the Thanksgiving shopping extravaganza. Hashtags such as #HandsUpDon’tShop and #BlackOutBlackFriday targeted the consumerism embodied in the weekend that traditionally kicks off the Christmas shopping season. Organizers focused on stopping “business as usual.” Protests across the nation included a die-in that temporarily closed the St. Louis area Galleria mall and protesters who chained or duct-taped themselves to trains or stations, shutting down Oakland/San Francisco’s BART rapid transit system for two hours. Ferguson-connected protests coincided and connected with other economic protests, including the three-year-old protests at Walmart stores from coast to coast, union organizing at big box retailers, and demands for a living wage. From the profits of private prison operators to employers and economic systems that profit from split shifts, minimum wages and job insecurity, organizers draw connections between racist systems, economic oppression and profits. 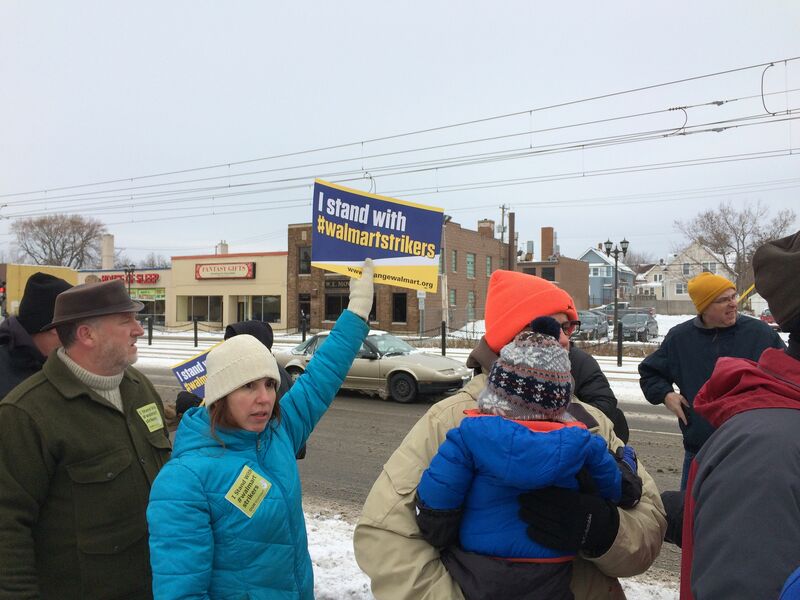 In the Twin Cities, Black Friday protests included support for janitors who clean big-box stores, Walmart workers demanding living wages and an end to retaliation, and fast food workers denied sick leave. Justice demands that we look at the painful facts of racism and economic injustice, and that we take action toward change. Those actions range from the direct actions protesting the consumer machine that brings us Black Friday, Cyber Monday and the entire shop-until-you-drop season, to educating ourselves and others, to speaking up at family gatherings and at work. As one of the speakers at the November 25 march said, “When this is over, it’s not over.” Time to keep working, my friends.